Recognizing excellence in Greater Boston theater, the 29th Annual Elliot Norton Awards were held on Monday, May 23, at the Paramount Mainstage in Boston's Theatre District. Presented by the Boston Theater Critics Association, the awards are named in honor of the distinguished Boston theater critic Elliot Norton, who for many years served on the selection committee and who remained an engaged supporter of theater, both locally and nationally. For 48 years Mr. Norton was a drama critic for several Boston newspapers; concurrently, from 1958 until his retirement in 1982, he was moderator of "Elliot Norton Reviews" on WGBH-TV. 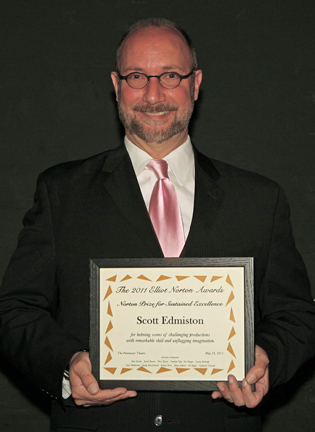 Scott Edmiston (at left), who's directed more than 50 productions in New England, was this year’s recipient of the Elliot Norton Prize for Sustained Excellence. In addition, a special citation was presented to Wheelock Family Theatre, celebrating its 30th anniversary this season. Following the ceremony, nominees, winners and fans gathered in the Paramount Blackbox for a reception. This year's winners are noted below in blue.